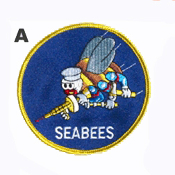 This authentic Seabee patches is embroidered in color on a blue twill ground. It features a colorful FIGHTING BEE that was created at Davisville, Rhode Island, in 1942 ... a small 3-inch patch; a 4-inch version; a distinctive 5-inch version and a huge, impressive 10-inch patch perfect for the back of a jacket. We also carry a 3-inch version of the SAV patch. PRICES VARY - The base price is for the 3-inch Seabee patch or the 3 /2-inch SVA patch. To check a price of other patches, select the item in the drop down window. The correct price will be shown as an increase of the base price.